archy: A few words about "mammoth"
A few words about "mammoth"
Brian at Laelaps has a nice post up about a magazine story and rumors of live mammoths in Alaska. The story, "The Killing of the Mammoth" by Henry Tukeman, appeared in the October 1899 issue of McClure's Magazine, a popular British general interest magazine of the day. Tukeman's story is a first person account of how he ventured into a lost valley on the Alaska Yukon border and there killed what may have been the last living mammoth. At the end of the story, Tukeman tells his readers that the bones of the mammoth were bought by a fabulously wealthy adventurer who donated them to the Smithsonian as his own discovery. All in all, Tukeman's tale is a fairly typical lost valley story, a very popular genre during the high tide of imperialism. Most of these stories have been forgotten, but some (those by H. Rider Haggard, Edgar Rice Burroughs, and Arthur Conan Doyle) are still occasionally reprinted and made into movies. One of the characteristics of the genre is that they usually told in the first person, with a framing sequence explaining hos the story came into the author's hands or why the author chose to tell it at this time -- usually the storyteller is the dying last survivor of the adventure who wants to make sure the tale doesn't die with him. At a time when there were still blank spots on the map and the general public believed that entire civilizations or ecosystems still waited to be discovered, it's not surprising that these stories were occasionally believed to be true. One such novel, The Smokey God, is still trotted out by believers in the hollow earth as the actual memoirs of someone who went there, despite that fact that many elements of the story are clearly borrowed from Edgar Allen Poe and that it contradicts Newtonian physics. This was the case with "The Killing of the Mammoth." As soon as it was published, the Smithsonian started getting letters from people who wanted to know more about Tukeman's mammoth and visitors who wanted to see the skeleton. The demand became distracting enough that McClure's contracted a paleontologist, Frederic A. Lucas, to write a nonfiction article on mammoths for their February 1900 issue. The editors prefaced the article with a note apologizing for the confusion. The Smithsonian republished the note and article in their Annual Report for 1900. Lucas graciously ends his article by pointing out that the Smithsonian doesn't have a mammoth skeleton and appeals to some wealthy benefactor to remedy the situation. Lucas' piece is a nice summary of the state of mammoth knowledge in 1900. It's worth reading as an historical document (which, of course, is why Brian and I have read it). However, he has one monstrous chunk of misinformation right in his first sentence. About three centuries ago, in 1696, a Russian, one Ludolff by name, described some bones belonging to what the Tartars called a "Mamantu"; later on, Blumenbach pressed the common name into scientific use as "Mammut" and Cuvier gallicized this into "Mammouth," whence by easy transition we get our familiar mammoth. "About three centuries ago, in 1696..." Maybe I'm nitpicking, but 1696 was just over two centuries before 1900. "...a Russian, one Ludolff by name..." Ludolf was German. There are many possible spellings of his name, so Lucas doesn't lose any points for the double "l". His only time spent in Russia was eighteen months in Moscow in 1693-94. He spent that time studying the Russian language and socializing with upper-class Russians including tsar Peter, not yet the Great. "...described some bones belonging to what the Tartars called Mamantu..." I'm nitpicking again. The linguistic origin of the word mammoth has been controversial right up to the present. Tartar was the leading contender in Lucas' day, so he's not to be blamed for choosing it. Some other contenders have been Russian, Samoyed, Tungus, Yakut, Ostyak, Estonian, Polish, and Hebrew, by way of Arabic. Tartar , or Tatar, still pops up even though the etymology that is given for it -- that it is derived from "mamma" meaning earth -- is completely false. The word "mamma" does not mean earth in modern Tatar and does not appear in any historical lexicon. I have a detailed post on the the name planned for later in my Fragments series. "...later on, Blumenbach pressed the common name into scientific use as 'Mammut'..." Johann Friedrich Blumenbach was one of the great zoologists of his day. One of his projects was to extend the Linnean system of classification and naming into areas that Linneas had been reluctant to tread. One of those areas was fossils. 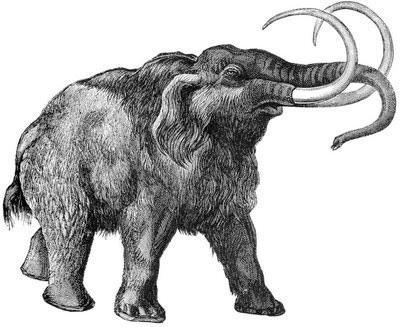 Blumenbach did indeed pressed "Mammut" into scientific use in 1797, but he applied it to the Armerican mastodon as Mammut ohioticum (mammoth of the Ohio). He called the Siberian mammoth, Elphas primigenius (the primeval elephant). That was later changed by biologists into Mammuthus primigenius, which makes things even more confusing. "...Cuvier gallicized this into 'Mammouth'..." "Mammout "was being used in French long before Blumenbach or Cuvier. For example Buffon wrote about the" prodigious bones of the mammout" in his Histoire naturelle five years before Cuvier was born. "...whence by easy transition we get our familiar mammoth..."The English were using the name and spelling "mammoth" at least as early as the 1720s. The short history of the introduction of the word mammoth into Western European languages runs something like this: In Ludolf's Russian grammar, he reported the word as "mammoutovoi." The first known use of the word in English was by the Royal Society's Robert Hooke, who gave the Society a report on Ludolf's book and spelled the word "mammatovoykost." The suffix "kost" is the Russian word for bone. Ludolf gave both forms of the word (mammoutovoi and mammoutovoikost), but Hooke appears to have missed the distinction that between mammoth and mammoth bone (tusk). Only 300 copies of Ludolf's grammar were printed and, thought it attracted the attention of scholars, it soon faded into obscurity. Ludolf's was not the first in-print mention of some form of the word mammoth in Europe. That honor goes to Nicolaas Witsen whose memoirs of travel in Russia described fossil ivory coming from the "mammout." His actual travels occurred in 1664-66 and his account was published in 1694, two years before Ludolf's grammar. There is a third candidate for who introduced the word into Europe. In the early years of the eighteenth century Evert Ysbrants Ides published a memoir of his journey across Siberia as an envoy for tsar Peter in 1692. Ides gave the spelling of the word as "mammuth." His memoir had far greater distribution than either Ludolf or Witsen's works. It appeared in Dutch in 1704, English in 1705, German in 1707, and French in 1727. By 1730 the word had taken its place in the major Western European languages in the same forms that is used today -- "mammoth" in English, "mammout" in French, "mammut" in German, and so on. The most interesting thing about all of these forms is that none of them has an "n" in the second syllable like Lucas' "mamantu", but the "n" does exist in the Russian form of the name "mamont." Another indication that the "n" in the second syllable was part of the original word comes from the earliest known record of the word. In 1718, Richard James, the chaplain for a failed British diplomatic mission to Moscow, filled his time while waiting for a ship to return him to London by compiling a lexicon of unusual Russian words. One of those words was "maimanto" an underground animal that was a source for ivory. James' etymology remained unknown until his letters were discovered in the archives of the Bodleian Library in 1951. So, while Lucas' version of the introduction of the word "mammoth" into Europe is wrong in almost every detail, it's right on the early pronunciation. That leaves the question of where did he get the idea that it could be traced to "mamantu" and that that word appeared in Ludolf's grammar. It looks like he found it in a dictionary. Where they came up with this is a mystery for another day. Unfortunately there is no preview available, but I currently have the book on loan from a 2nd cousin.